Oatmeal comes from a simple grain and yet this unsung hero of the grain world is bursting with vital nutrients such as manganese, phosphorus, copper, biotin, vitamin B1, magnesium, dietary fiber, chromium, and zinc. Oatmeal is amazingly one of the only foods to retain most of its nutrients through processing. Virtually all oatmeal that is available has been processed in some way. Minimal processing is a simple cleaning and hulling of the oats. Screening and air blowing are used to remove seeds, non-oat grains, and loose hulls from the oats. Once the oats are cleaned and hulled they are referred to as oat groats. Groats are sold in some stores, but usually, there is further processing into the oatmeal we see on store shelves. Oatmeal is versatile and amazing for soothing skin. It has natural proteins and saponin that have wonderful benefits for skin, most of which we cannot discuss due to FDA regulations but we will explore how to use this amazing ingredient. Let’s talk about the most common types of oatmeal found in stores: Old Fashioned Oats, Steel Cut or Irish Oatmeal, and instant oatmeal. Steel cut oats are simply chopped up groats and they undergo the most minimal processing, Old-fashioned oats or rolled oats are oat groats that have been steamed and rolled to produce that recognizable flat, disc-like shape. After rolling, old-fashioned oats are heat-dried to reduce moisture. Instant oatmeals typically vary from old-fashioned rolled oats in at least one of two ways. They are either rolled into thinner flakes or steamed for a longer period of time—or undergo both processes—in order to produce easier-to-chew oats that can be prepared at home quite quickly. There is also a finely ground oatmeal that is ideal for making lotions and bath soaks called Colloidal Oatmeal. This finely ground oatmeal stays suspended evenly in water and must meet US Pharmacopeia standards for size and composition. This is by far my favorite type of oatmeal to use in formulating lotions, cremes, bath bombs, and bath soaks. The type of oatmeal you choose for your skincare depends on how you want to use it and what you want to make. Steel cut oatmeal is a powerful exfoliant in body and hand scrubs, although it may be a little rough for most bodies. I prefer to use this type of oatmeal for scrubs designed for gardeners or mechanics. The oats help scrub away dirt and grime but are probably too rough for other formulations. Old-fashioned oats can be used for a gentler exfoliation and they also make a great addition to soaps and facial masques. I love oatmeal soap with bits of real oats, especially for fall and winter! Colloidal Oatmeal is the real star in my humble opinion. Finely ground so it’s not abrasive, this easy-to-work-with ingredient is versatile and inexpensive. Oatmeal comes from a simple grain and yet this unsung hero of the grain world is bursting with vital nutrients such as manganese, phosphorus, copper, biotin, vitamin B1, magnesium, dietary fiber, chromium, and zinc. 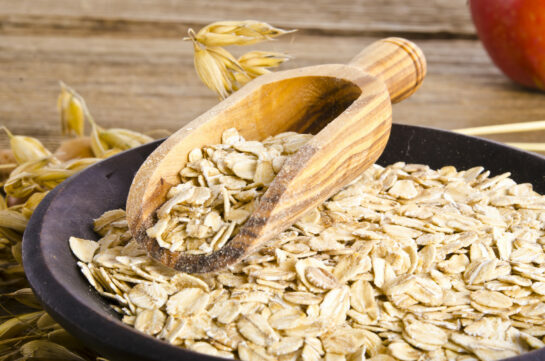 Oatmeal is versatile and amazing and is especially effective at soothing skin. Using your stick blender, slowly sprinkle Xanthan Gum into your pot while mixing with your blender, be sure to mix constantly to avoid any clumps. You will notice your water phase getting more viscous so you may have to increase the speed of you blender as you add the xanthan gum. Place the following ingredients in a pot or microwave-safe container and heat until completely melted or to 170 degrees. Make sure your water phase ingredients are still hot and at about 150 degrees. Slowly pour the melted oil phase ingredients to the Water Phase ingredients while constantly mixing with your stick blender – be sure to use your stick blender the entire time while slowly adding Oil Phase ingredients to Water Phase ingredients. Continue to mix until all ingredients are fully blended, and your lotion is fully emulsified. O’Neil CE, Nicklas TA, Fulgoni VL, et al. Cooked oatmeal consumption is associated with better diet quality, better nutrient intakes, and reduced risk for central adiposity and obesity in children 2-18 years: NHANES 2001-2010.